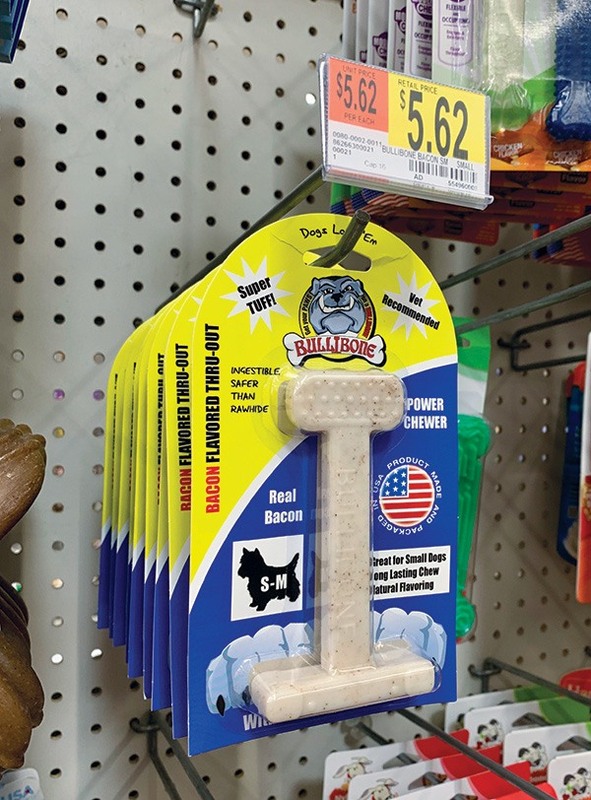 LeeBob Willingham and his business partner Trevor Jensen may seem like an unlikely tandem, but their combined passion for dogs, ingenuity and business savvy has landed their product — Bullibone — on the shelves in some 3,880 Walmart stores. A few years ago, Willingham, a mechanical engineer from Mount Vernon, Ill., became concerned when his beloved senior English bulldog Boogie started chewing on anything he could find in the Willingham home. He said the nylon bones on the market didn’t work because Boogie could not hold on to them, and the dog lost interest. That’s when Willingham went to work to find a solution. In 2013, he set out to create a nylon bone with a substance at the base for easier gripping. He told the Northwest Arkansas Business Journal he experimented with several flavor profiles for the bones. Willingham set out to put bacon flavoring throughout the bone that intensifies with each chew so dogs stay interested. He said the original prototype was refashioned to include the paw pads for easier gripping, and all the work was done in his garage. His dogs loved the new chew toy. And Boogie could easily stay occupied for hours and no longer had an interest in the family shoes. Willingham made the six-hour drive to Bentonville and met with a pet toy buyer in 2014. He said the retail giant liked the product and said they would get back with an offer. Some 30 days later, Willingham got an email from Walmart and invited him back to Bentonville. Willingham said it didn’t take long to realize he was in over his head, so he reached out to a business contact in San Diego who had pet category experience and strong business acumen. Trevor Jensen had experience in structuring startups and then scaling them. He bought into the business and took over the day-to-day operations, leaving Willingham the time to set out and find the manufacturing capacity to fill the order. Bullibone, a dog chew toy, can be found in approximately 3,880 Walmart stores across the nation. Willingham cuts the molds himself and then outsources the manufacturing. Jensen said Bullibone manufacturers make roughly 700,000 products a year, and that supports between 40 to 60 manufacturing jobs in the Midwest with respect to Walmart’s order. In San Diego, there is a small team of roughly 10 who run the wholesale and retail business relationships, set up logistics, do accounting and handle the marketing for brick-and-mortar and online customers. Bullibones hit Walmart shelves in March 2016 with two items and has since expanded with a third product. The retail giant offers three sizes of Bullibone chew toys ranging in price from $5 to $9.98. Jensen said sales of the Bullibone toys are rising 40% annually, and the next meeting with the retailer is slated for May. 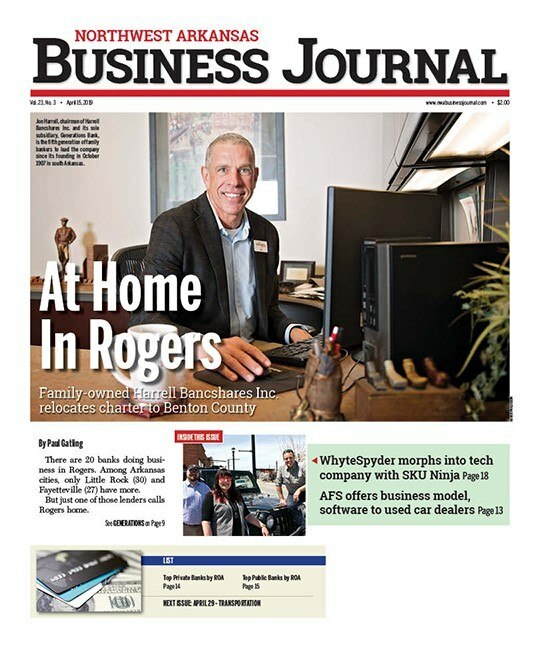 With Jensen handling the day-to-day management of the retail business, Willingham continues to turn out new products, which he hopes to pitch to Walmart in the future. Walmart marketing has worked closely with Willingham to help him tell his story through various media outlets. Jensen said Walmart made a short commercial of Boogie and the Bullibone in 2016, which aired during a streaming episode of “Game of Thrones”, and sales immediately skyrocketed some 70% in certain areas of the country. Jensen said the company worked with a couple of banks in the Midwest to finance the inventory for the initial Walmart order. He said the banking partners have been crucial to the ongoing success of this growing enterprise. “We continue to be honored to work with Walmart as a small supplier that helps support U.S. manufacturing jobs. I lost my beloved Boogie last year at age 14, but I have three other dogs that love the chew toys,” Willingham said. Jensen added the partnership with Walmart has been eye-opening because of the scale. He said Walmart tells you what they are going to do, and they do it. He said the biggest challenge can be fulfillment, and suppliers cannot miss a shipment. He described Walmart as transparent and forthright. “We have added many other retail customers now, both online and brick-and-mortar, and Walmart has been one of the easier ones to deal with,” Jensen said. Jensen and Willingham hope to have an expanded line of pet oral care products sold at retailers in the next year. The pet toy market is valued at more than $1 billion annually, with dog chew toys comprising roughly 75% of that total, according to a report from Packaged Facts in 2017. Pet oral care products and services in the U.S. were estimated at $5.2 billion in 2017, growing at roughly 4% annually. With Walmart’s help, Bullibone aims to garner some of that market share in the future.